Josh Rosebrook's skin and hair care products have a great reputation in the green beauty world, so I was excited to try out something from the range when the Deep Nourishing Shampoo & Conditioner were included in abeautifulworld's A/W sampler back in October. It took me a while to get around to testing them out since I was using up some other samples first, but now I'm almost finished these travel sized bottles I figured it's about time to share this duo with you! I've tried my fair share of natural hair products so I'm used to them often being low-sudsing (SLS free), but this Deep Nourishing Shampoo is the only one I've tried that doesn't foam up for me whatsoever. It's a completely different and bizarre experience washing your hair without any suds at all! (Update: turns out my bottle was one of a few that had an uncommon problem with the foaming agent, I'll update you again when I've tried a new bottle of the shampoo!) It has a herbal citrus-y scent and the texture is kind of like a lotion, so I can see why the instructions advise dividing the hair into sections (top, sides, back) to make sure everything gets covered. When you rinse it out, it doesn't leave that squeaky clean feeling so you know it's not stripping the scalp of natural oils. I was actually really surprised to find that once my hair dries I have a lot more volume at the roots and less noticeable flyaways. It seems to irritate my scalp slightly for a few hours after washing though - I'm guessing this could potentially be due to a sensitivity to potassium sorbate and/or various essentials oils included in the ingredients (see ingredients list here). The Deep Nourishing Conditioner is one that I think would be the perfect lightweight conditioner for fine hair. Unfortunately I need something more hydrating and heavy duty for my thicker, dry hair type, but this did give a nice amount of shine to my hair. I've heard through the grapevine that Josh Rosebrook's range may be expanding at some point this year so I'm intrigued to see what comes next! I've also had my eye on the Hydrating Accelerator from the skincare range - it contains a few of my favourite ingredients and I've read some great reviews from other bloggers! These travel sized bottles are 2oz and cost £7.50 each, available from abeautifulworld.co.uk. 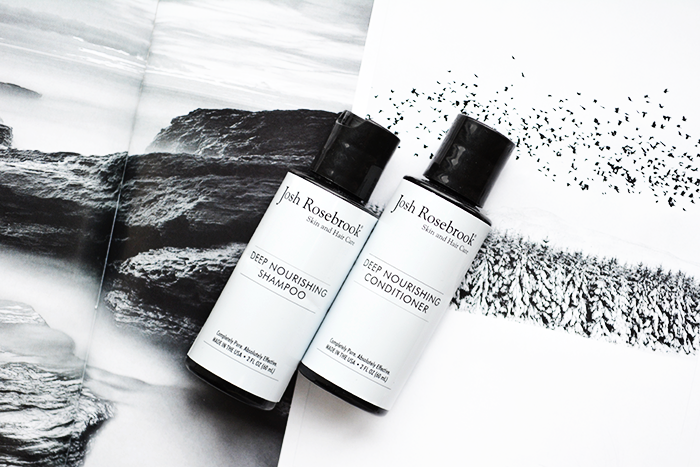 Have you tried any products from Josh Rosebrook's range before? I've wanted to try Josh Rosebrook's shampoo & conditioners as well. Not sure the conditioner would work for me since my curly hair needs much moisture too.